The Long Road to China: Where Are The Parents? This past week, we have really enjoyed the beautiful fall evenings. The kids and I have made a couple trips to the park....Sarah has a new obsession with sliding boards and swings....the girl is all about motion....and Nick loves to do anything outdoors...he is just happy to get away from the homework! Then, this weekend we went to my nephew's birthday party at THIS indoor fun center....we had a great time! The kids loved it....so did the adults....food, big screen televisions for the sports enthusiast, and games galore!! Had to include the birthday boy....My sister with her son Aidan! Now....to make my point.....Playgrounds and Play Centers.......Kids running everywhere causing major chaos...and my question...Where are the parents? I was shocked at the number of kids running amok....with not a parent in sight! Kids of all ages...big ones and little ones...bullies and lost little souls looking for someone to give them attention. I am sure if you have frequented any of these places you have witnessed this for yourself.....so that leads me to my next question??? What do you do when a child is behaving in a way that they are endangering the safety of other children...namely yours? At the fun center....Sarah was in the ball zone...not a pit...it is just a big obstacle course that the kids climb, crawl, and slide through...anyway, most of the kids were pretty young as this is geared towards the little ones....and at the time...it was filled with all little girls. I was standing on the ground as I watched these girls literally fling Sarah out of their way and crash into her on the sliding board....I thought for sure she would be in tears....she got right up and kept climbing to the top....still with a big old smile on her face! I tried to politely say something to these girls, but that did nothing.....I held my breath each and every time she climbed up.....even went as far as going up there with her for a short period of time to play referee....but that didn't work. The little ones couldn't move around me....and I was being smacked in the head with balls that were flying across the room.....just imagine me climbing through the tunnel with Sarah and other kids pelting me in the head with nerf style balls that shoot from air guns....what a sight! At this point, I tried to get Sarah out of the ballzone but that was not happening....so I let her go....now, Pat walks over to see Sarah in action.....it took him all of 30 seconds to see what was going on and I hear him say......What are these kids doing??? Someone is going to get hurt....Where are their parents?...Did you say something to them? Now he was going to try...first time politely....second time....a little stern......third time....I said, forget it....they are not going to listen...let's get her out of here. Next thing you know, right infront of us as we are walking out.....she trips as someone is trying to push past her...hits her mouth...bites her lip...blood running down her chin, she is in tears. We have all been in these situations.....what have you done or what would you do? I felt the only option was to leave.....but that doesn't seem fair. Needless to say, we won't be visiting these kind of places during prime time. 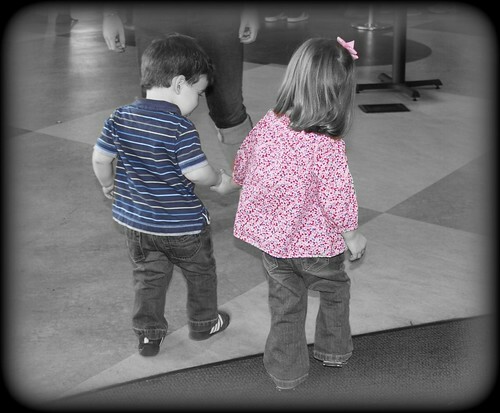 Sarah and Aidan walking hand in hand......had to end the post with a cute picture!!! I know, I know! An older boy grabbed my Jane's hand hard, very hard, and mean, twice in a row, at a play area a few months ago. On the third time before I could stop myself I flew across the area in about 3 large steps and sternly told him at him to NEVER touch her again. 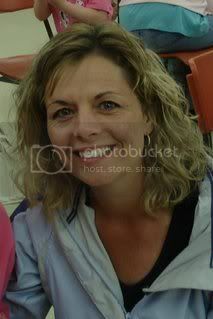 I am the mom of 4 boys, but I am SO tired of parents who just do not want to see what their children are doing! We have certainly been in similar situations. We usually just go to another area until the bullies are gone! I often wonder where the parents are though! Love the picture of Sarah and Aiden! I used to be a teacher, so... I react like a teacher. It doesn't win me any popularity contests, but I can't seem to help myself. Oh - I am not one to ask. I can get pretty defensive!! Same with my husband. We saw a little boy punch our son in the back and I thought my husband was going to put him over his knee!! Uggh. I usually say something to the child if they are inappropriate - like that isn't the way that we treat people. Uggh. Yes, where are the parents???? I would always be too afraid someone would take off with my child! Adam has such gorgeous eyes!! Sweet pics!!! Poor baby, sorry she got hurt! I completely know where you are coming from. 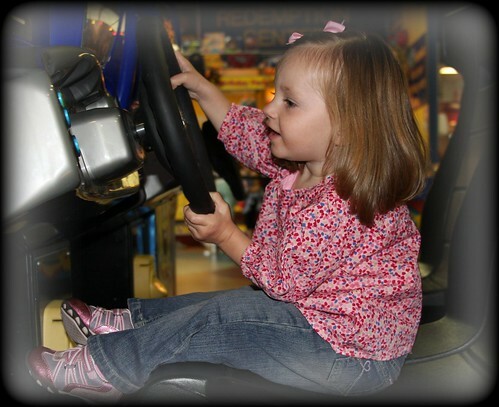 We took the girls to one of those adventure places last night to go cart riding and putt-putt golfing. There were tons of kids, but very few parents. And in the climbing/ball areas, I know it is much worse. I'm a big chicken, so I'm afraid what might happen if I say something to someone else's kid, so I just normally get my girls and move them someplace else until the other kids have moved on, but it doesn't seem fair. The pictures are precious. Sorry your sweet Sarah didn't get hurt. I will say something. If my young, defenseless kid's good time is being infringed upon by some obnoxious kids - I don't stand for it. I have said something to many kids and never had them ignore me. I'm not sure what I'd do if I was ignored. Sometimes we just have to get our Mamma Bear on. Well, I'm guilty. Last week at Chuck E Cheese's Amelia wouldn't sit down to eat with us, so I was watching her from the table. All of a sudden she was GONE. My sister jumped up to run around the thing that was blocking our view and then an employee and another parent came around the other side with her...How embarrassing! She was only out of site for 30 seconds, but she was alone long enough to be scared. My trying to teach her a lesson about doing what I ask taught be one. Don't EVER let your kid wander. I, too, was a teacher and I always seem to be the playland supervisor while others are sitting back chatting! Last week, at my sons soccer practice, I was at the playground with my girls and there was a little 3 yr. old alone there the entire time. Even if her mom was at one of the practices, she was so far and could not see. It amazes me how parents can do that...I barely let my kids go outside without me! Have had the same thing happen at some indoor playgrounds and have, at times, told the bigger kids that they need to watch out for the little kids! It is so frustrating and some kids are just so wild -- then it is generally time to leave. Sorry that happened Sarah. Great photo of your sister and her son and Sarah! BTW...next Thursday works for me....let me know when and where! I have definitely experienced this. At the indoor playground at Chick Fil A, parents will just drop their kids off while they eat lunch and the kids run like crazy people and don't care if there are babies present. I have had to get on kids a number of times because the parents aren't there and just don't care. It is really sad. I had to report some older kids at DAC Kids once because they were launching themselves into the inflatable toddler area from another inflatable. So dangerous! It isn't fair that you should have to leave because other parents aren't doing their jobs. It's so maddening! And I am sorry Sarah got hurt too! I totally agree, and I have been there LOTS of times!!! Some kid spitting, pulling hair, or being generally horrible to my kids, and no parent in sight. I have to say, I have taken it upon myself to say, "Don't do that. That's not nice!" in my most serious voice. It usually scares them enough that they stop. Maybe their parents don't care how they act, but I do!! I'm with you, though... we just try and avoid those places during "rush hour"!!!! Very sweet pictures of Sarah & Aidan. They are such cuties! Oh do I hate that!!! When Richie was smaller like Sarah I honestly avoided places like that. I can't stand when parents are oblivious to what their kids are doing. Drives me absolutely insane and I think as a pediatric physical therapist I have a catalog of injuries that flash through my head when I watch kids who could potentially hurt themselves or others. What I really want to do is go up to some of those parents and smack them in the back of the head and yell "wake up stupid. look what your kid is doing". I bet I know where the parents were...socializing in front of the big screen tv's letting other parents, like you, look after their kids. I've seen it 100 times. I would have left the area as well because, unfortunately, some kids ruin it for the other kids. I used to remove my child from the situation (come check out this game over here-it's very cool-that type of thing). I know, it doesn't seem fair, but in my experience, saying something to the bullies and/or their parents doesn't do any good. They think that's what these places are for - for the kids to run wild and for the parents to "take a break". I'm sorry that Sarah got hurt. That child should have apologized to Sarah. I am ALWAYS yelling "where are your parents???!!!!" I hate that!! I am another one who always finds myself saying where are the parents! I will always say something to the kids!! I hate going to the park with kids climbing up the slide and then acting like Kelsey is in the way when she is trying to go DOWN the slide! It is tough to decide what to do in these situations. But we have certainly had our times where we have felt the same way! I'm sorry that you had to go through that! Those places are crazy! I don't understand why the parents weren't there. I'm guessing if they wouldn't listen to you or you hubby they probably don't listen to their parents. Had similiar experience at a local indoor gym, very upsetting when it endangers your child's safety. Some parents don't care, very upsetting! Spoils the whole experience for our children. Love the last photo, adorable!! Yeah...don't even get me started on this topic. The teacher part of me tends to come out as well as the mother bear part of me...these are definitely situations I tend to stay away from. I just detest it! And ultimately, I seem to end up being the mother in charge of all the kids...which I also don't like! Yup, I go with the teachers voice too, and a little bit of puffing out my chest. If that fails I take the child and shout, who does this belong too? And can you please keep him/her under control!!! I know what you mean. Sometime you wonder if the parents drop their kids off and leave. The last pic is soooo cute. Oh Lisa, I totally know what you mean and I don't know what to say. I do feel like I have been in those situations, and it is always so hard because I don't just want to be listening to my over-protective mama radar, but those situations are dangerous for little ones, even if I am not their mama! Good for you for getting Sarah out, but I ask the same question: where were the parents??? As a former 8th grade teacher, I guess my default is to get rather stern with the kids. I figure if the other parents have a problem with it, they can step up and tell me. I would rather have them mad at me than my kid be hurt (or anyone else's kid for that matter). Those places can be a bit overwhelming, huh? I find that the parents that care about their children's behavior and interaction with others...are right there with them as you were with Sarah. The kids that are left alone to behave however they see fit....generally have parents that do NOT care.....therefore trying to talk reason with the parents would get nowhere...they just DON'T CARE! Which is also why the kids did not respond when you tried to direct them. My kids would be horrified if another adult tried to tell them to behave...they would be in tears. I do the same thing as you...I move on. It's not fair....it's actually very sad. Love the sweet picture of Sarah and her cousin!!! OH Lisa...I remember these situations in our past when Chelsi was a little one....and honestly Chuck and I are both very outspoken when it comes to safety and our child! We both would speak up at any given moment...even go so far as to tell that child to get bring their mommy or daddy over here so that we can talk to them. Oh yea....when it comes to Chelsi.....my claws come out! I am so sorry you all experienced this "not nice" activity especially at a very special party ! 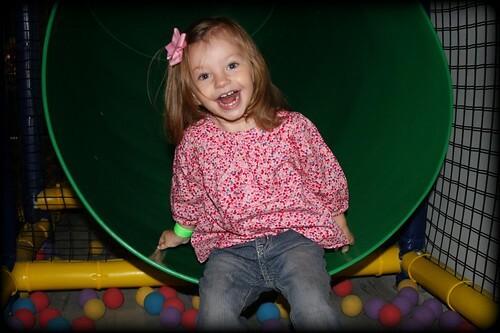 I hope the next time is full of complete fun and fairness in the play areas! I'm always amazed how parents lack of responsible. I see kids walking the streets at times even where I don't see a parent in sight. I often want to shake the parents, and ask why they had children if they have no responsibility for their welfare. Oh, don't even get me started!!! I avoid these places. I tried them out when my son was younger, but it never failed...he was always sick the next day. That right there gave me reason to not go anymore. I found myself disciplining other children at Mini golf recently while the parents were right there! You did the right thing!!!! It is hard and I too try to avoid those type of situations all together. I will say something to a smaller child who may just be oblivious of what is going on around him (you know...the self centered toddler) but older kids I generally don't. I will however say loudly and clearly to my children that we are going to play in a different area or whatever since THAT child or THOSE children are NOT playing nicely in hopes that the parents will hear and do something. Usually parents don't do anything so we move to a different area. I don't have any children of my own.. but I am a teacher. I am the one who offers to help correct a behavior in a store, um. Yep, that would be me.. It is so hard. Katie was being pushed out of the way by older boys on the playground last week in Georgia. They were telling her she was taking to long to get up on the slide. They were literally pushing her out of their way. We moved the kids to the smaller playground. It is crazy the way some kids behave. Where are the parents???? Ahh, that last pic is just precious. We were at the soccer park last week and a little boy (7ish) was throwing rocks randomly. One of the rocks hit one of our little kids so our kids dad told that kid (parents no where in site) to stop. So what did the kid do? He threw a rock right straight at the dad that told him to stop! I thought our guy was going to come unglued. The kid wouldn't admit where his parents were and finally looked a little concerned when the dad said he'd call the police. At that point the little boy ran off toward another teams group of parents. One of the parents on our team bet that if that kids folks came over, then we'd all figure out exactly why he was like that - and it's because the parents are either bullies themselves - or worse - they just don't care. I'm glad your little girl was not too badly hurt, although a bloody lip is way more than should have ever happened if the other parents had any idea (or care) of what their kids were doing. It's just so sad! I just happened upon your blog... I have enjoyed reading it thus far. I know how you feel about these things though. We have a bully in our neighborhood that always seems to say mean things, especially to my daughter, and she honestly, has never said anything mean to him. If anything, she usually goes out of her way to say hi and stuff to him! A couple of weeks ago, my hubby finally had enough of his behavior, and sternly pointed his finger at him and told him if he didn't have anything nice to say, don't say anything at all! I was dumbfounded when his parent got upset and even went as far as call the police!!! For pointing!!!! Unbelievable. I wonder where these parents are and what they are thinking. Sorry your little one got hurt. And sorry I am blabbing on and on!